For most of the situation, it is the most efficient gear for catching large and small pelagic species that is shoaling. A beach seine is a seine net operated from the shore. 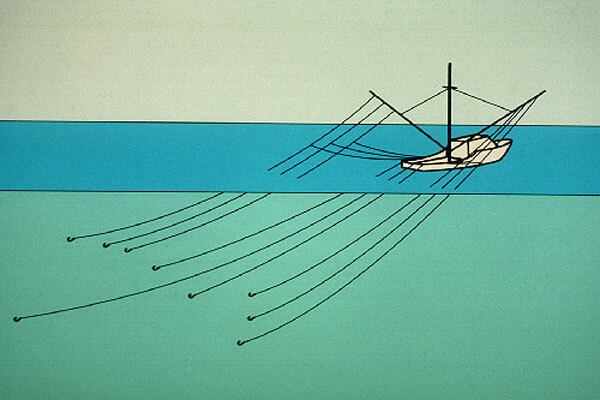 A purse seine is made of a long wall of netting framed with a lead line of equal or longer length than the float line. A bottom pair trawls is a cone-shaped net consisting of a body, normally made of two or four panels, ending in a codend and the net has lateral wings extending forward from the opening. The trawl nets are cone-shaped net (made from two, four or more panels) which are towed, by one or two boats, on the bottom or in midwater (pelagic). These are gears consisting of a mouth frame to which a holding bag constructed of metal rings or meshes is attached. These are small, light dredges consisting of a mouth frame attached to a holding bag constructed of metal rings or meshes. Portable hand lift nets are small lift nets operated by hand, often supported by ringed frames. Lift nets consist of a horizontal netting panel or a bag shaped like a parallelepiped, pyramid or cone with the opening facing upwards. These lift nets, which can be relatively large, are usually operated from stationary installations situated along the shore, where the lifting system are sometimes mechanized. The cast net is a circular net which is casted from the shore or from a small boat, but, in general, in shallow waters, to catch fish by falling and closing in on them. Cover pots and lantern nets are used to cover fish on the bottom, in shallow waters. The fish which is trapped is taken through an opening in the upper part of the gear. 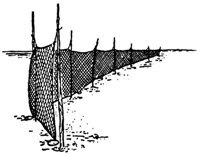 A set gillnet consists of a single netting wall kept more or less vertical by a floatlineand a weighted groundline. Driftnets consist of a string of gillnets kept more or less vertical by floats on the upper line (headrope) and weights on the lower line (groundrope) (sometimes the groundrope is without weights), drifting with the current, in general near the surface or in mid-water. Encircling gillnets are gillnets set vertical, in shallow waters, encircling fish. 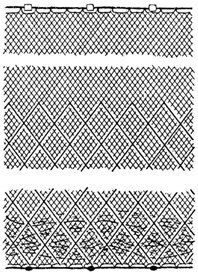 A trammel net consists of two/three layers of netting with a slack small mesh inner netting between two layers of large mesh netting within which fish will entangle. These gillnets are stretched between two or more stakes driven into the bottom within the inter-tidal area, along the cost. This bottom-set gear consists in two parts: - an upper one being a standard gillnet where semi-demersal or pelagic fish may be gilled and - lower part being a trammel net where bottom fish may entangle. A pot is designed in the form of cages or baskets, small or large (with dimensions ranging from around half a meter to two), made from various materials (wood, wicker, metal rods, wire netting, plastic etc.). This is a stationary gear made from netting, usually in the form of a cone or pyramid. This is a group of gears made of various materials (stakes, branches, reeds, netting, etc. ), and they are usually installed in tidal waters. Jumping fish and gliding fish can be caught on the surface in boxes, rafts, boats and nets ("verandah nets"). Stationary uncovered pound nets consist usually of net walls anchored or fixed on stakes, reaching from the bottom to the surface. A vertical line consists of a line to which is attached sinker and one or several hooks. In commercial fisheries the lines have usually several hooks. A set longline consists of a main line and snoods with baited hooks (occasionally unbaited) at regular intervals and which is set, in general, on or near the bottom. A drifting longline consists of a mainline kept near the surface or at a certain depth by means of regularly spaced floats and with relatively long snoods with baited hooks, evenly spaced on the mainline. A trolling line consists of a line with natural or artificial baited hooks and is trailed by a vessel near the surface or at a certain depth. A pole and line consists of a hooked line attached to a pole. These are gears for killing, wounding or grappling fish, whales and marine mammals. In its simplest forms the harpoons are built from a wood pole having a steel point with one or more fixed or movable barbs at its forward end. Clamps are well known in many parts of the world, especially for taking mussels out of the water without injury. Simple or modern complicated rakes may be employed to catch the desired aquatic prey. Objects may be taken from the water in uninjured condition by means of tongs that is with instruments provided with two tong-like clasps moving one towards the other. The fishing spear in its simplest form is the fisherman's most primitive gear is known from prehistoric times. Many methods have been used for harvesting seaweed and other water plants. Pumps as fishing gear can be used only for the harvest of dense concentrations of small species (or cephalopods) not too far from the surface (but occasionally up to almost 100 meters). Push nets are scoop netsnets which are pushed, footing in very shallow waters or before a small boat. In addition to stupefying fish by mechanical and chemical means, it is also possible to narcotize them with electricity. Fish can be caught by driving them into a fishing gear of any type. Most of them are caught also without driving, but in small quantitives. This gear type includes the operation of gathering by hand or with simple hand implements with or without divingequipment.